There's a record attempt going on right now. A 20ft Cat is attempting best a 9.6knt average for 2551 nm. I don't know much else about it as their site is in Italian perhaps? Live tracking can be seen here. Thanks for posting this. I found the English translate button at the bottom of the page. Incredible. How do they sleep? Love the boat, it was custom designed for crossing the Atlantic, it's already crossed the Atlantic once in 2017. Quote The 20-foot ocean catamaran, designed specifically for the record by Studio Balance Arquitectura Naval from Sito Aviles Ramos , is built entirely of carbon. It is a very solid boat, fast and unsinkable by its 14 watertight compartments. With this same boat, Vittorio and Nico Malingri have conquered the Atlantic crossing record in 2017. It has been controlled and optimized for the new company, with the collaboration of the designer and with the support of the C-Catamarans shipyard. "It is a very solid boat, fast and unsinkable by its 14 watertight compartments. " The Titanic was deemed "unsinkable" also and we all know how that turned out. Quote The Titanic was deemed "unsinkable" also and we all know how that turned out. 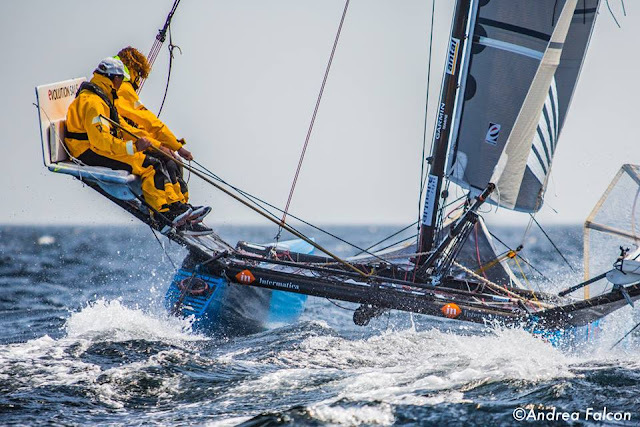 Sinkable or not, they are sailing an open 20 foot beach cat across the Atlantic - plenty of other potential ways for the sh!t to hit the fan real quick. Can people not learn from HIST0RY!!! This has been tried before, see below tale of the H18 crossing. BOTH PARTICIPANTS SAID DO NOT DO THIS AGAIN!!! 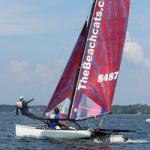 lot of Hobie sailing experience. The two men thought they were prepared. We hope others who may be planning such adventures take note. noodles and six large pieces of cake. Then he too retired for the evening. See THIS LINK page 24 for the complete story. Quote Can people not learn from HIST0RY!!! This has been tried before, see below tale of the H18 crossing. BOTH PARTICIPANTS SAID DO NOT DO THIS AGAIN!!! Edited by MN3 on Feb 11, 2019 - 03:00 PM. Regarding Trans Atlantic danger, there were probably the same naysayers in the 15th century. Luckily for all they set sail anyway. Quote Regarding Trans Atlantic danger, there were probably the same naysayers in the 15th century. Looks like a scene from the Truman show. I have now read most of this. These 2 yahoo's are lucky to have lived through this/ Seriously lucky they didn't need to amputate their feet off. They woefully over-estimated the ability of a H18 and hugely underestimated what they needed to do this. "When night came, I asked Daniel not to sleep. The first wave ran toward us, and I've never seen a bigger one. It had to have been more than ten meters. The wind increased to 60 knots and we hauled down all the sails. Despite that, the boat was surfing like crazy. I couldn't control it anymore." they spent days without stretching and exercising their muscles? what did they think would happen? "Finally, the two learned that even if the boat, rigging and the sails were able to stand up to the punishment, the critical points such as clothing and survival equipment need a lot more preparation and careful thought. Improvements need to be made." I fully support their statement "DO NOT DO THIS AGAIN!!!" Edited by MN3 on Feb 11, 2019 - 03:53 PM. "Some times stuck for days! (in the ICE)" "The Arctic is a very Harsh Place!" nice pics of polar bears. Someone should ask why they picked yellow hulls and sails instead of white? It's a testament to the Hobie's H18 & H21 strength that these guys survived, but it was well beyond their boats envisioned design recommendations!!! 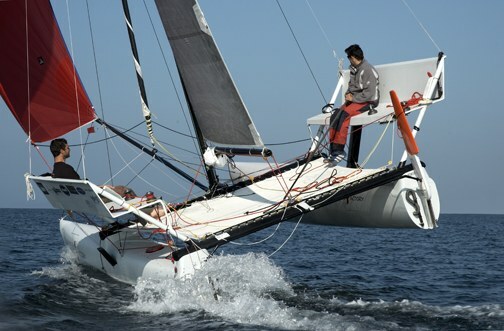 After 14 days 3 hours and 40 minutes from the departure in front of the Isle of Gorée in Dakar, Ocean Cat crossed the finish line in front of Pointe à Pitre, in Guadeloupe. 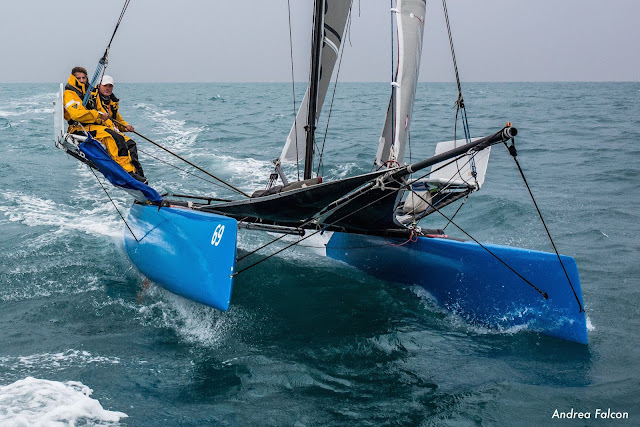 The two Italian sailors, Giammarco Sardi and Tullio Picciolini have not managed to improve the record Vittorio and Nico Malingri made in April 2017, but have accomplished an equally unique undertaking for the particularly demanding weather conditions they found during the route.